"The best way to spread Christmas cheer is by singing loud for all to hear..."
and also by donning festive clothing and accessories! I know Christmas is nearly upon us, but I wanted to share some holiday dressing tips. (Really, these can work for ANY holiday, not just Jesus' birthday.) As I've said in previous posts, Santa hats are not merely decorations, they're accessories! It's a shame if they're not used to their full potential. Cheesy sweaters can be worn. Get out those jingle bell earrings! However, Christmas clothing can go greatly awry if you don't follow some simple guidelines. You can be cheerful AND chic at the same time. *Only wear one large cheesy item of clothing at a time. For example, wear the sweater, NOT the sweater and the red pants with the candy canes. Wear the skirt with the garland around the bottom, but NOT with the red and white striped tights. Make sense? Pair that one large cheesy item with something stylish and the whole thing will work brilliantly. *Christmas-y socks are fine, but your pants need to be the right length. No, it's not okay to "show them off" by wearing pants that are a bit too short. (Especially with mules.) And YOU KNOW that's not okay, too!!! I love fun socks just as much as everyone. But they're not a "see all the time" kind of thing, they're a "catch a glimpse every so often" kind of thing. You just try and get away with it because it's Christmas. Like when you wear cute shoes... they're not an excuse to wear the pants that shrunk up in length too much so "everyone can see your cute footwear." There's not EVER a good excuse for those pants! Stop trying to rationalize their length and give them to the thrift store now. NOW! Seriously. Get up from your computer, go to your closet, put them in a bag, and go set that bag on the hood of your car to take to the thrift store. You know the ones I'm talking about. Go. *Santa hats are to be worn! To the grocery store, the sports practice, the post office. Wear them! If you have long hair, let it flow. Some of you with short hair have commented that you feel a bit insecure. If that's the case, wear some chunky earrings. But look at the photo of Amber at the bottom of this post. She totally rocks it! *Smile!!! If you are going to wear festive holiday clothing, you must do so with a light heart and joyful spirit. There's nothing worse than someone in a bright Christmas-y outfit scowling and trudging around. Especially if they have feathered bangs, and are wearing candy cane pants. I'm sure there are some things I forgot. I just wanted to throw this post together last minute. It was necessary. What other tips for holiday dressing do YOU have? Leave me a comment and let me know! I am so sad that I missed out! It would have been nice to have been somewhere where we could go outside without freezing. 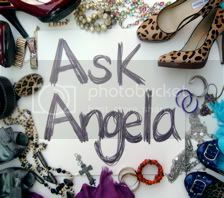 I really need these fashion tips, Angela, I feel like a tomboy a lot of the time because I do not know how to buy clothes let alone how to wear them. Make up that is just another story. I am going to be one of those mothers that has the same hair do when the kids graduate from college because I don't know what else to do with it. You rock! 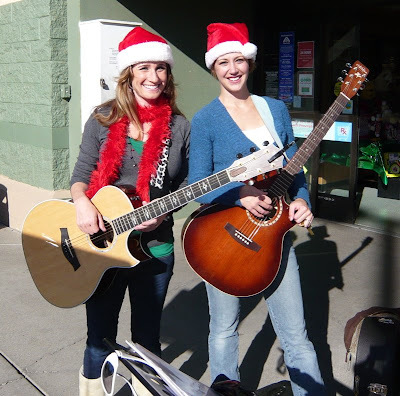 SO fun to see you two together :) I bet you two just rocked those Albertson customers ears! I am bummed I missed your singing and guitar playing. I hope you and yours have the best Christmas. Cheers! What fun! Hilarious christmas rules about dressing. You are making me miss you guys so so so very much. Merry Christmas girl, I Love You. This is a bit late....but thanks for stopping by my blog. You are hilarious! I loved reading your post. And when I read about mules, feather bangs, etc, all I could think of was my aunt. It is like she just has to typify the stereotypical Indiana mom (no offense to Indiana..>I mean, I live in Kansas, its not different). So fun!! Next year, I hope to get a little more festive than I was this year!